As time unravels and her enemies close in, Zahra finds herself suspended between danger and desire in this dazzling retelling of Aladdin from acclaimed author Jessica Khoury. From Goodreads. 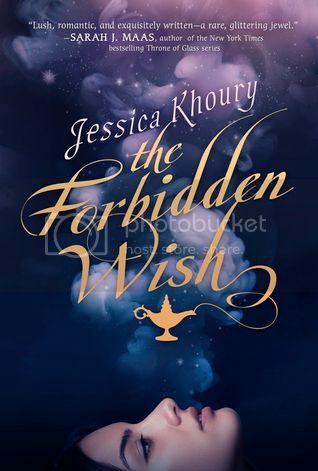 The Forbidden Wish by Jessica Khoury is a retelling of Aladdin, and as soon as I heard that, I knew I had to read this book. And then discovering that it was being retold from the genie's - or jinni's - perspective, and that in this retelling, the jinni is female, I was even more excited to read it! And The Forbidden Wish is fast paced, action packed wonder, full of magic and excitement! Zahra is a jinni who has been trapped in her lamp for 500 years. When Aladdin, a homless pick-pocket, is drawn to her lamp by a magic ring, she is finally released from her captivity. The vizier to the King killed Aladdin's parents in front of him, and with the help of Zahra, he wants to seek his revenge. Zahra suggests he wish to become a prince and try to seek the hand of Princess Capsida, and once they are wed and he has power over the vizier, he can make his life a misery. What Aladdin doesn't know is that Zahra has been given a message from the Lord of the Jinn, Nardukha; his son, Zhian, has been captured and is being held in the palace. If she can free him, Nardukha will grant Zahra her freedom. Zahra's plan isn't to help Aladdin at all, but to get herself in the palace. But the longer she spends with Aladdin, the harder she finds it to abide by the number one rule of the Jinn: don't fall in love with a human. The Forbidden Wish is a completely epic story. It's a fast paced and action packed high fantasy based on the story of Aladdin from The Arabian Nights. So much happens, it's non-stop. It's almost like two stories in one; the story of Aladdin and his time in the palace, trying to woo Princess Capsida despite her being betrothed to Prince Darian, the vizier's son, and the story of Zahra, her involvement in the fall of Queen Roshana 500 years ago, and her quest for freedom present day by trying to find Zhian and free him. There are obstacles in both their paths, and time is of the essence as Zahra only has one month to find him and release him before Nardukha and all the jinn will destroy Aladdin's town Pathenia,everyone in it, and will kill Zahra. And even then, when it looks like everything will finally come to it's conclusion, there is this twist, and the story takes a shocking direction. Things were pretty awesome already, but then the action is taken to another level, and it's so much woah! Epic in a grand scale! I would have liked to have seen more of Aladdin; for the most part, he's more of a tool for Zahra at first, a way for her to get into the palace, and because of that, we get more of Zahra than Aladdin. For a retelling of his story, it was a bit of a shame to not have more of him and his life. I would have liked to have got to know him better. But Zahra narrates the story, telling her story, and it's a fascinating one. Perhaps I would have enjoyed it more if it was told in dual narration, but the story in physical format is 352 pages - I read the eBook, but even with that I knew it was long because of how long it took for the bar to move - so if it was in dual narration, it would have been seriously long. The romance didn't do it for me, sadly. I didn't really feel it, and wasn't wowing or swooning. For me, it wasn't developed enough; there was more of Zahra in her head and her thoughts on how she was going to accomplish things for her and Aladdin - even when they're together - than there is of her focusing on him and how she feels about him. Though the moments we do have are sweet and tender, and even a little steamy, I just didn't feel it. The Forbidden Wish is such an amazing story, and I absolutely loved it! There is so much happening, so much to discover, and so much about Zahra's past to try and work out. The Forbidden Wish was absolutely gripping, and such a thrill to read! If you enjoy retellings and/or high fantasy set in a Middle Eastern/South Asian inspired setting, I would highly recommend getting this book on your TBR ASAP!